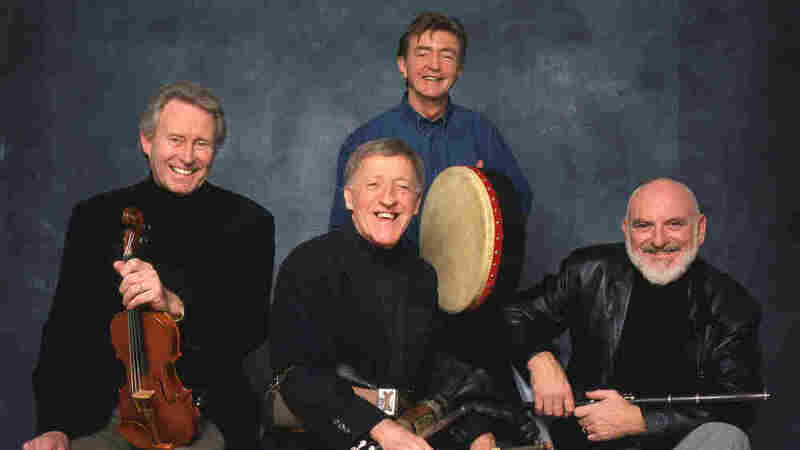 The Chieftains: For 50 Years, Irish Music For The World Over a long career, the Irish folk band has worked with almost everybody, just about everywhere. Paul McCartney, Madonna, Doc Watson and Luciano Pavarotti have at least one thing in common: They've all collaborated with Irish folk band The Chieftains. The band, credited with helping to revive Irish music, is celebrating its 50th anniversary and a career that includes more than 50 albums, six Grammys and an Oscar. The latest album, Voice of Ages, includes recordings of traditional songs with help from indie-rocker Bon Iver, folk group The Civil Wars, string band Carolina Chocolate Drops and country trio Pistol Annies, among others. Chieftains founder Paddy Moloney tells Morning Edition's Renee Montagne that it all began for him in the 1940s, with a gift from his mother. "I was 6 years of age," he says, "and my mother bought me what you call a pennywhistle — a tin whistle — for one shilling and nine pence." The Chieftains began in 1962, at a time when rock 'n' roll was king. Moloney's goal was not only to bring back traditional Irish music, but to infuse it with new life. "I adapted my own style of arrangements and little compositions and riffs here and there, and harmonies," he says. "It got to be heard everywhere by the likes of John Peel, who was the great disc jockey of that era, in the '60s and '70s and '80s. And John was playing our tape in among the Beatles and Rolling Stones." The Chieftains collaborated with everyone from Tom Jones and Elvis Costello to Van Morrison and John Hiatt — even Mick Jagger. "I remember, in the '60s, Mick coming to one of our concerts in Dublin," Moloney says. "I never realized, you know, that there were people out there listening and wanting to get back to roots, get back to where it all might have started from." The Chieftains went to Nashville, too, where the band worked with Lyle Lovett, Rosanne Cash and Ricky Skaggs. "For me to go to Nashville was almost going to another part of Ireland, meeting up with all your country cousins and just go for it," he says, "because you didn't have to duck and dash with these people — they knew the music. And if you played it once or twice, naturally they'd just pick it up and play it." For one collaboration, in the '80s, The Chieftains went all the way to China. There, the group blended traditional Chinese music with its own sound. "Some of the pieces you will hear — melody-wise there's a big difference, but it's the same ideas, you know, music to do with the seasons, to do with love, to do with battles that took place," he says. "It's just so Irish in a way. And we took a trip down the Yangtze River with all our Chinese friends, and we got them up dancing the 'Walls of Limerick,' which is a set dance, an Irish set dance. They were very suspicious at the beginning, and they weren't quite sure what to make of us, you know, but the Maotai was taking effect on them as well as us." Maotai is a Chinese liquor, and gan bei is a common Chinese toast — their slainte: "That means bottoms up," he says. "That's how we got them all dancing." The Chieftains' members have traveled even farther afield to make music. "A very good friend of mine, Cady Coleman, she's an astronaut," Moloney says. He gave her bandmate Matt Molloy's flute, one of his own tin whistles and some sheet music the last time she went up to the International Space Station. That St. Patrick's Day, Moloney says, the group got a missive from way up high. "Straight to Matt Molloy's iPad comes this Cady," Moloney says. "She's floating and she plays the tune that I gave her, 'Fanny Power,' which is on the album [under the title 'The Chieftains in Orbit'], and she floats away, her hair sticking up in the air, and the tin whistle floats with her. I took that recording and put it on so when you hear her whistle sort of disappearing to the left, I come in on the right. So we have done funny things in our time, you know?"